Please join me in remembering YET ANOTHER great icon of the entertainment community. The Pillsbury Dough Boy died yesterday of a yeast infection and traumatic complications from repeated pokes in the belly. He was 71. 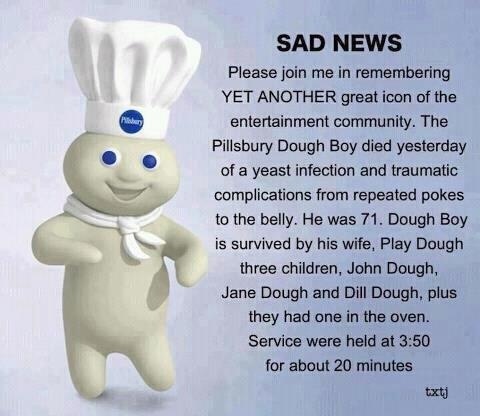 Dough Boy is survived by his wife (Play Dough), three children (John Dough, Jane Dough and Dill Dough), plus they had one in the oven. Services were held at 3:50 for about 20 minutes.